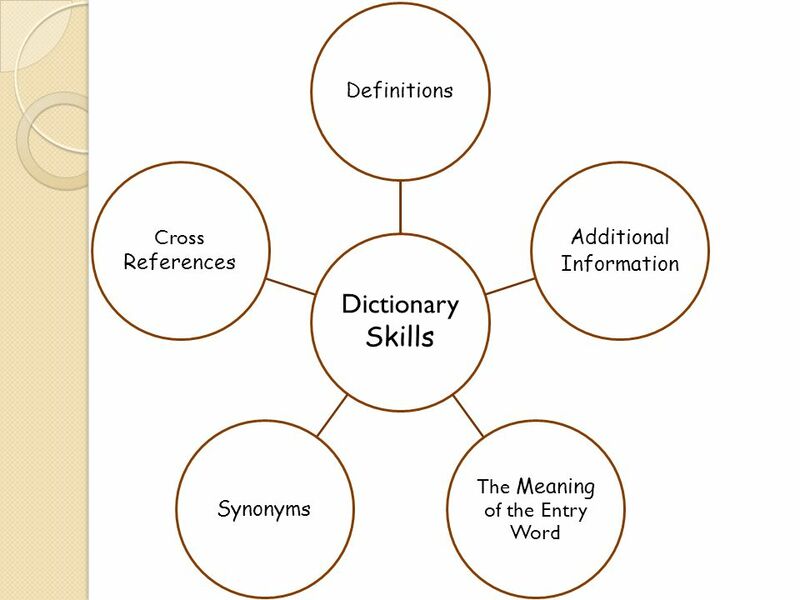 2 A dictionary is… a reference book containing words, usually alphabetically arranged along with information about their forms, pronunciations, functions, and meanings. 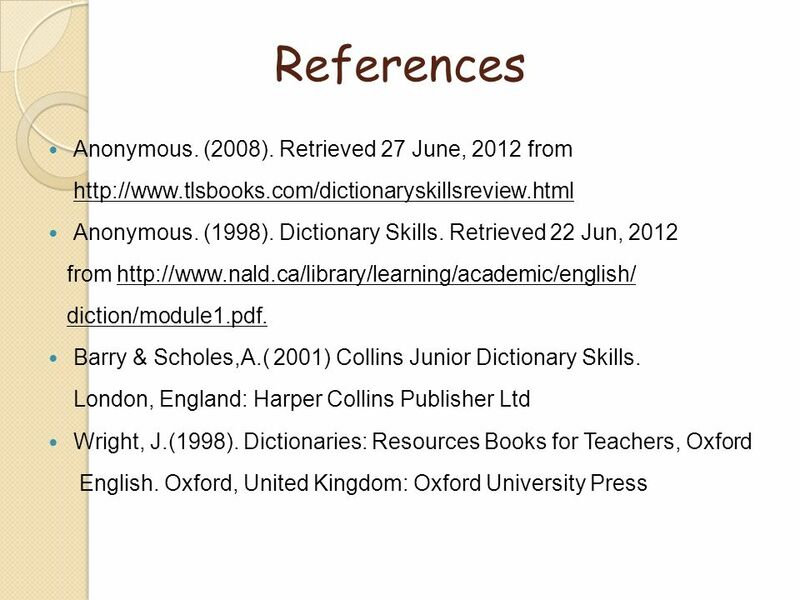 a reference book listing terms or names important to a particular subject along with a discussion of their meanings. A sample sentence is often included. Dictionaries: guidebooks; They tell how words are used by people. It is a reference book. It gives information about words. 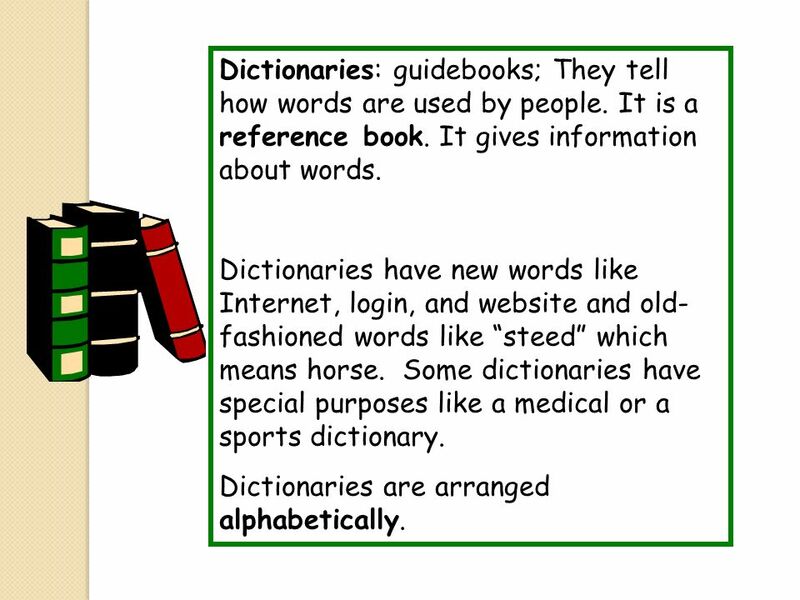 Dictionaries have new words like Internet, login, and website and old-fashioned words like “steed” which means horse. Some dictionaries have special purposes like a medical or a sports dictionary. Dictionaries are arranged alphabetically. 4 Types of Dictionaries Unabridged: Not shorten; complete; a large, extensive dictionary that is not based on a larger edition. The unabridged English dictionaries attempt to contain all words in the English language. 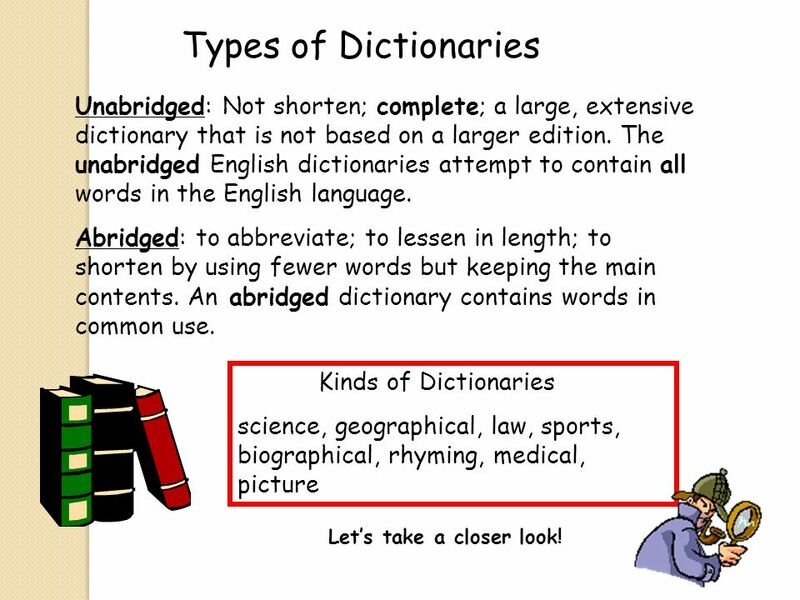 Abridged: to abbreviate; to lessen in length; to shorten by using fewer words but keeping the main contents. An abridged dictionary contains words in common use. Kinds of Dictionaries science, geographical, law, sports, biographical, rhyming, medical, picture Let’s take a closer look! 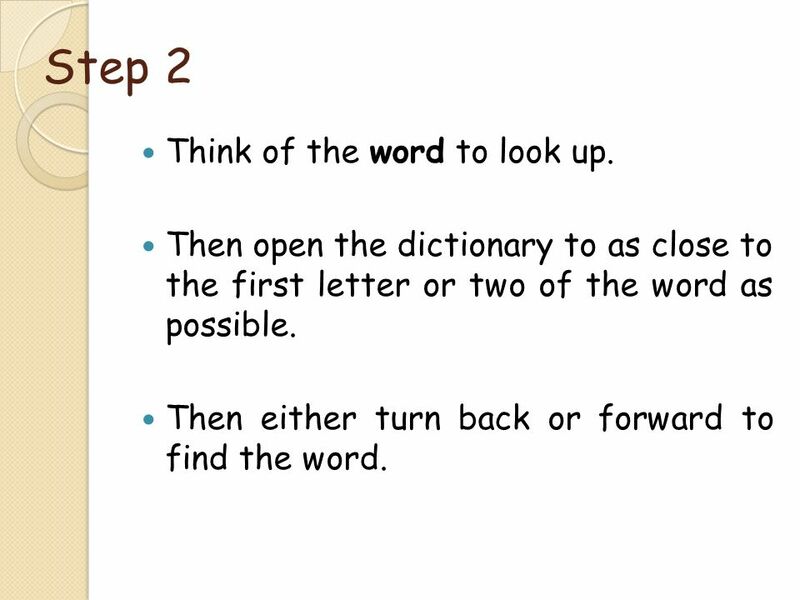 6 Step 2 Think of the word to look up. 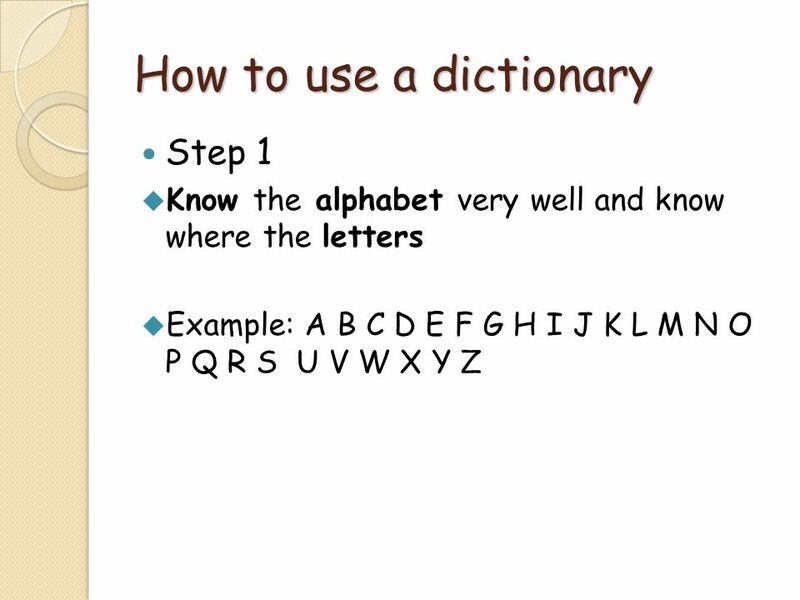 Then open the dictionary to as close to the first letter or two of the word as possible. Then either turn back or forward to find the word. 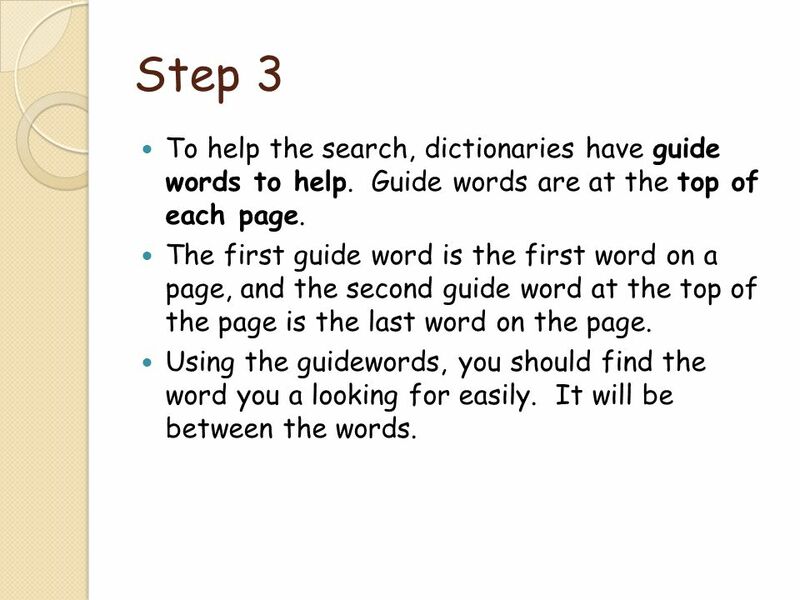 7 Step 3 To help the search, dictionaries have guide words to help. Guide words are at the top of each page. The first guide word is the first word on a page, and the second guide word at the top of the page is the last word on the page. Using the guidewords, you should find the word you a looking for easily. It will be between the words. 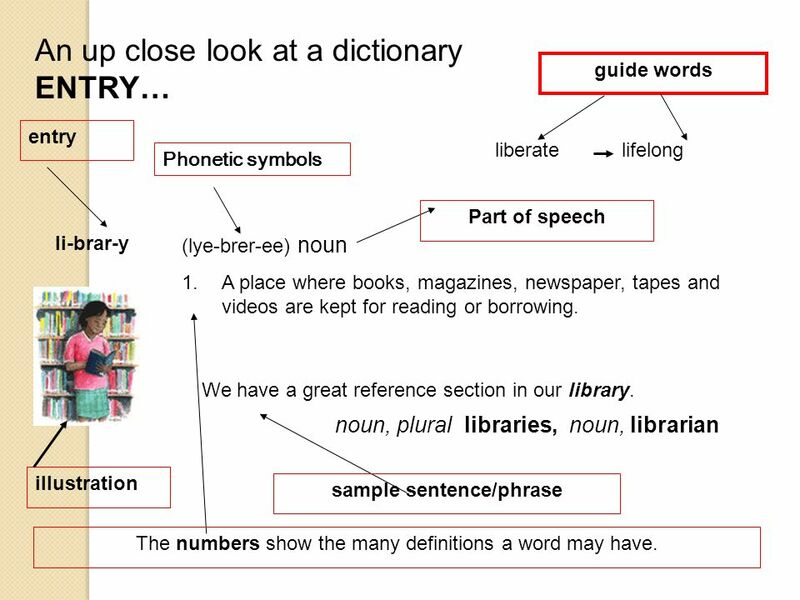 An up close look at a dictionary ENTRY… guide words entry liberate lifelong Phonetic symbols Part of speech li-brar-y (lye-brer-ee) noun A place where books, magazines, newspaper, tapes and videos are kept for reading or borrowing. We have a great reference section in our library. noun, plural libraries, noun, librarian illustration sample sentence/phrase The numbers show the many definitions a word may have. A lots of information in each entry, but also contain extra information in sections at the beginning or the end. 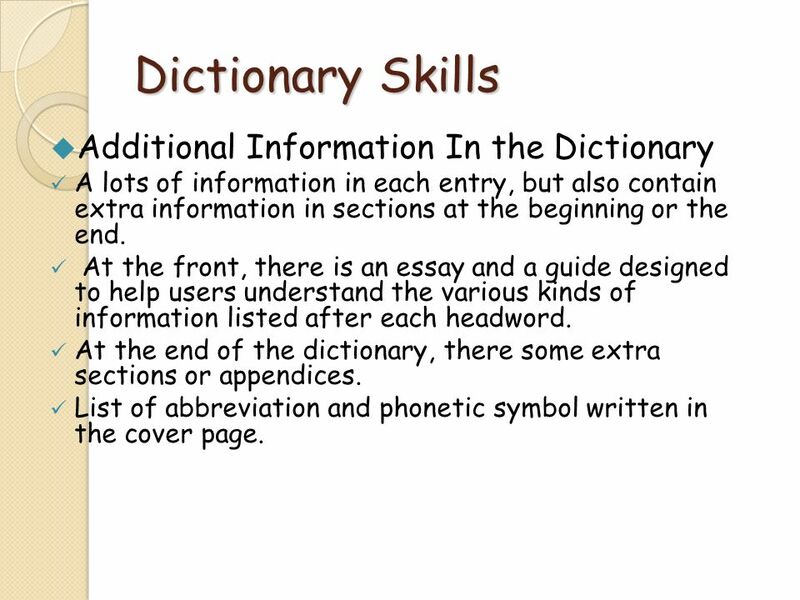 At the front, there is an essay and a guide designed to help users understand the various kinds of information listed after each headword. At the end of the dictionary, there some extra sections or appendices. List of abbreviation and phonetic symbol written in the cover page. 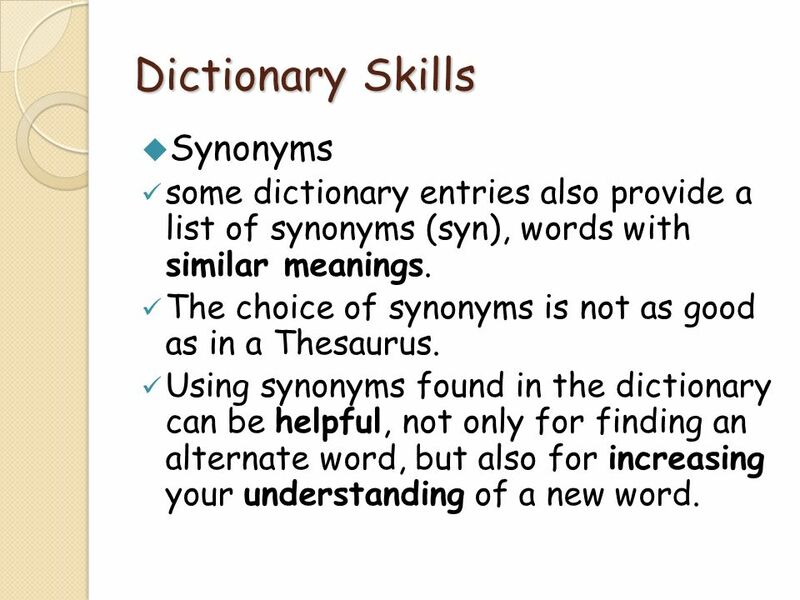 some dictionary entries also provide a list of synonyms (syn), words with similar meanings. The choice of synonyms is not as good as in a Thesaurus. Using synonyms found in the dictionary can be helpful, not only for finding an alternate word, but also for increasing your understanding of a new word. 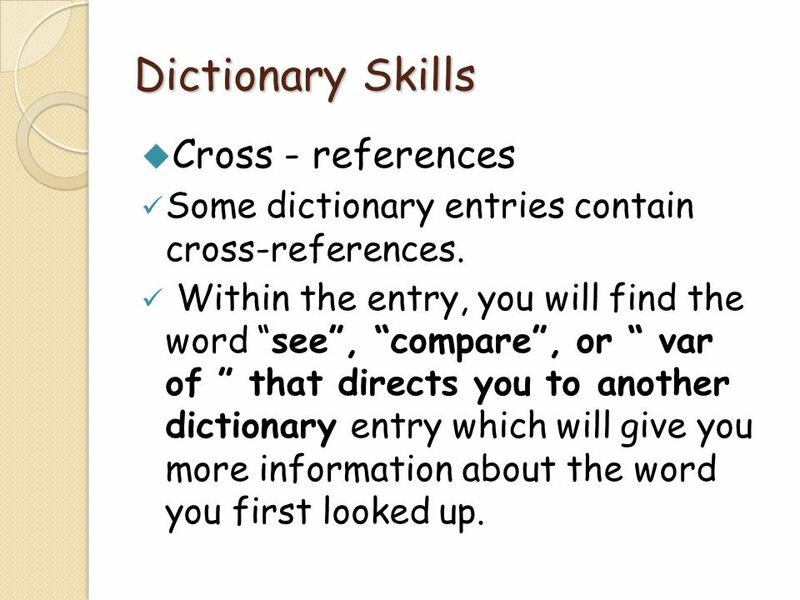 Some dictionary entries contain cross-references. 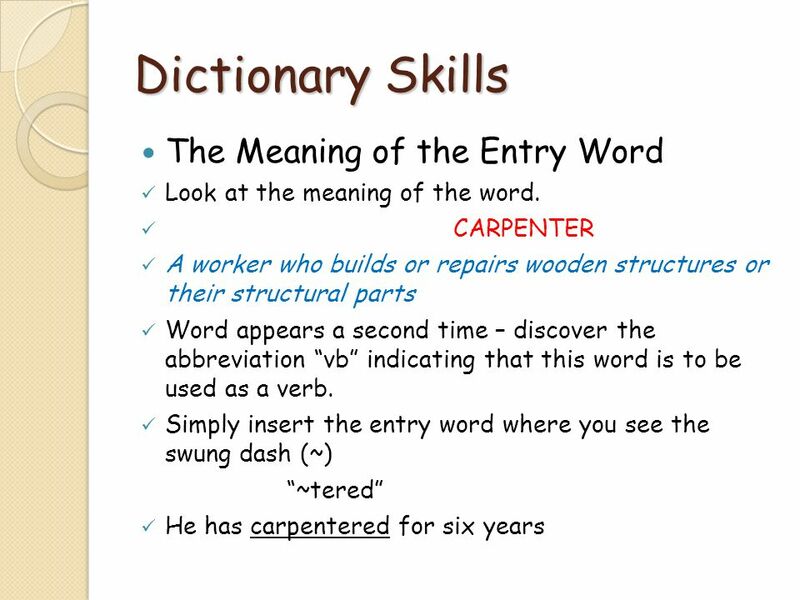 Within the entry, you will find the word “see”, “compare”, or “ var of ” that directs you to another dictionary entry which will give you more information about the word you first looked up. 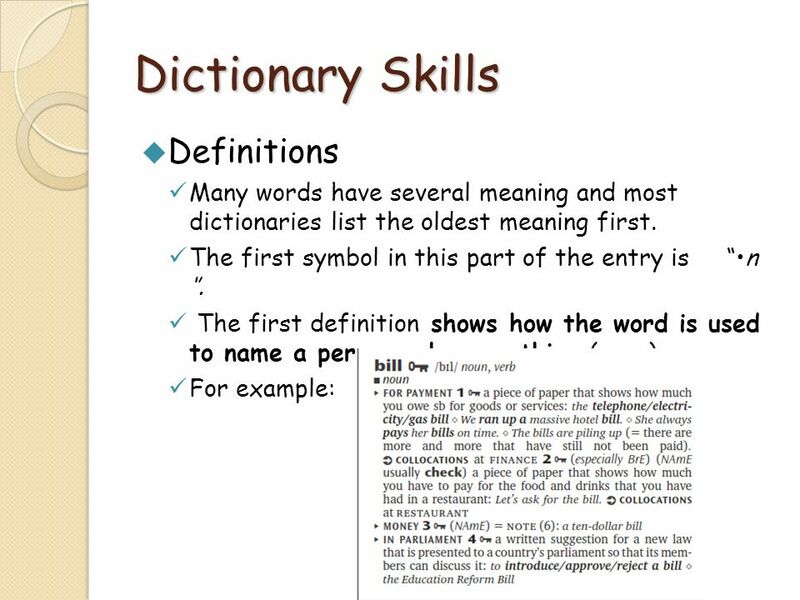 Download ppt "Dictionary Skills Members: 1. Goh Teck Song 2. 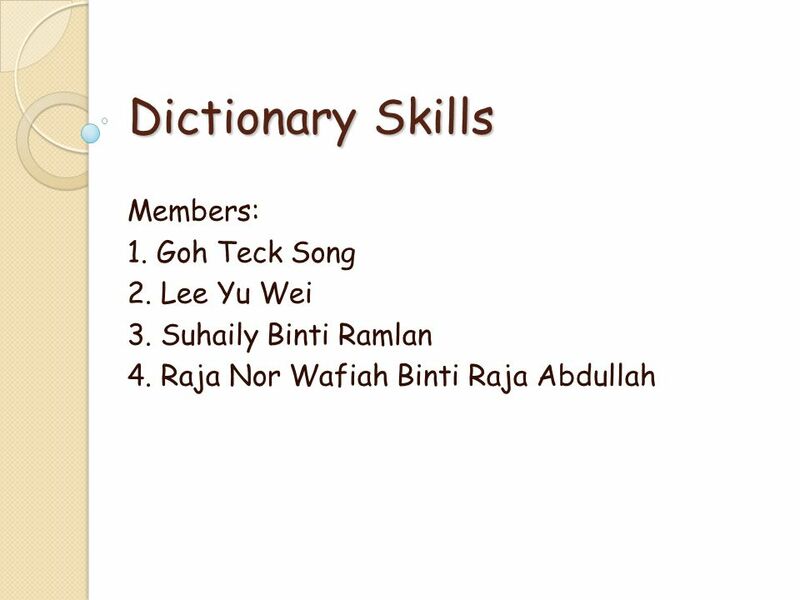 Lee Yu Wei"
DICTIONARY Get to know your. How is a Dictionary Organized? A dictionary tells you the meaning of words and how to say them. G ROUNDWORK FOR C OLLEGE R EADING WITH PHONICS Fourth Edition John Langan © 2008 Townsend Press. Reference Sources Print Online Library References 8Almanac 8Atlas 8Biographical Dictionary 8Dictionary/Unabridged Dictionary 8Geographical Dictionary. How to use online databases for research purposes? UIC library. What is a dictionary? By Mrs. Wilkin. What is a dictionary? Non-fiction (true) Information about words Reference book  Not read from cover to cover. 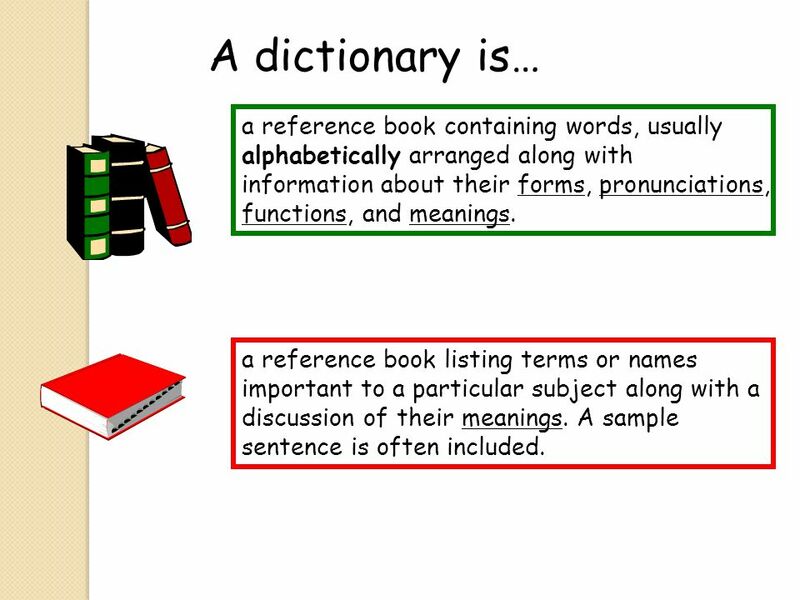 How to use a dictionary By Emilea G. Where can I find a Dictionary In the Library Reference section In the Library Reference section In the Library on. Let’s Use a Dictionary! What do we do first?. Dictionary Skills 3 rd Grade. How are dictionaries organized?? Alphabetically, or ABC order!! Library and Composition Skills Grammar Chapters 18 and 20.